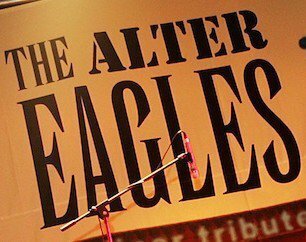 The Alter Eagles are a six piece Eagles tribute band based in the south of England. Since their debut gig in January 2004, they\’ve established themselves as one of the top UK tribute acts, playing numerous theatre shows across the UK and at festivals such as The Chichester Real Ale and Jazz Festival and Eastbourne\’s Magnificent Motors Show, as well as key venues like The Fleece in Bristol, the Boom Boom Club in Sutton and The Horns in Watford. The Alter Eagles are going from strength to strength, inspired by a common purpose – to produce the finest and the most authentic tribute to the Eagles that anyone has ever seen. 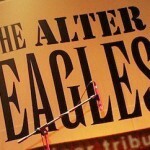 Their two hour plus show includes all of the Eagles’ biggest hits, including Hotel California, Life In The Fast Lane, Lyin’ Eyes, Take It Easy, and Take It To The Limit as well as some of the band’s most powerful ballads like Desperado, I Can\’t Tell You Why and Wasted Time; there\’s also room for key solo numbers like Henley\’s Dirty Laundry and Joe Walsh\’s classic Rocky Mountain Way; and of course, tracks from the Eagles’ last double CD – Long Road Out Of Eden. Each song is genuinely faithful to the original and that’s what the band reckons sets them apart.